At right, scooters await riders during SXSW. 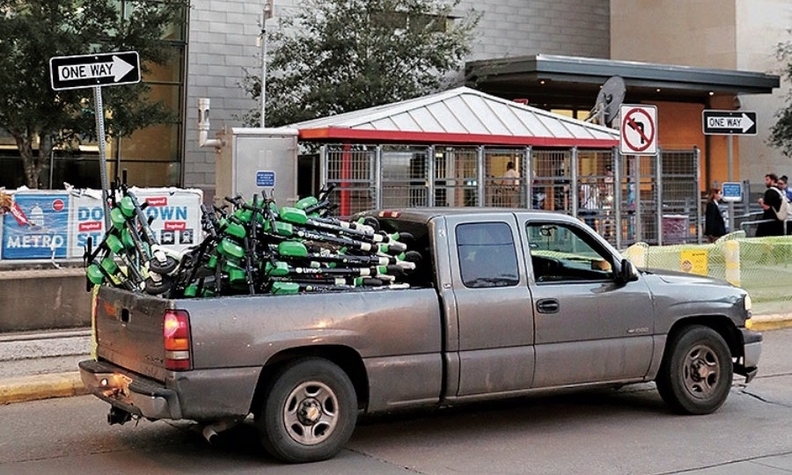 Far right, a pickup is filled with scooters outside the Austin Convention Center. AUSTIN, Texas — For better and worse, scooters were everywhere during this central Texas city's annual SXSW showcase this month. On streets. In bike lanes. On sidewalks. At an annual event where it's common to find industry leaders and high-ranking government officials discussing future-minded transportation modes such as self-driving vehicles, flying taxis and Hyperloop, scooters were the most compelling mobility storyline this year. It developed in real time on the streets around the Austin Convention Center. Users took more than 377,000 rides on more than 10,000 scooters during the 10-day event, according to the Austin Transportation Department, an influx that highlighted the potential and pitfalls of a type of transportation that has rapidly grown in popularity over the past year. At times, scooters seemed like an optimal transportation mode, perfect for hauling riders among SXSW events throughout the downtown; the city's data show the median distance of a trip was 0.65 miles. 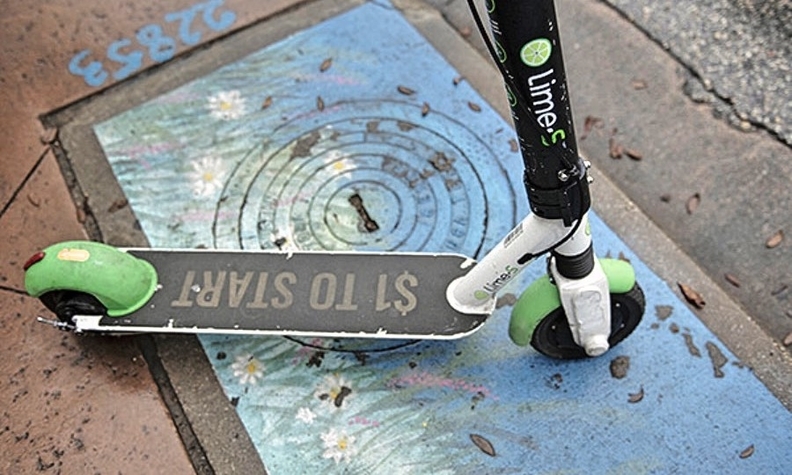 Yet at other times, scooters inspired a proliferation of four-letter words — beyond the brand names Lime, Bird, Jump, Skip and Spin. Riders were on sidewalks crashing into pedestrians, in bike lanes angering bicyclists and joining cars and trucks on city streets. "My Uber driver almost hit one," said Shailen Bhatt, CEO of the Intelligent Transportation Society of America, echoing a familiar sentiment heard around the show. "How long until someone gets on an interstate on one just to show they can?" Amid the SXSW frenzy, Lyft, which holds a permit for 1,500 scooters in the city, distributed a "Guide To Good Scootiquette," which addressed the "madness of scootopia," and confessed that scooters had "mutated into one part transportation, one part social experiment." Experts marveled at the rapid adoption of scooters, questioned how infrastructure should evolve to handle their arrival, worried about the safety of helmetless riders and pedestrians and debated the role of regulation for a fledgling transportation mode. While Austin is hardly alone in grappling with the scooter phenomenon, it may be at the forefront. The city has issued permits to 10 mobility operators, and set limits on the number of scooters they can deploy in the downtown and overall city limits. 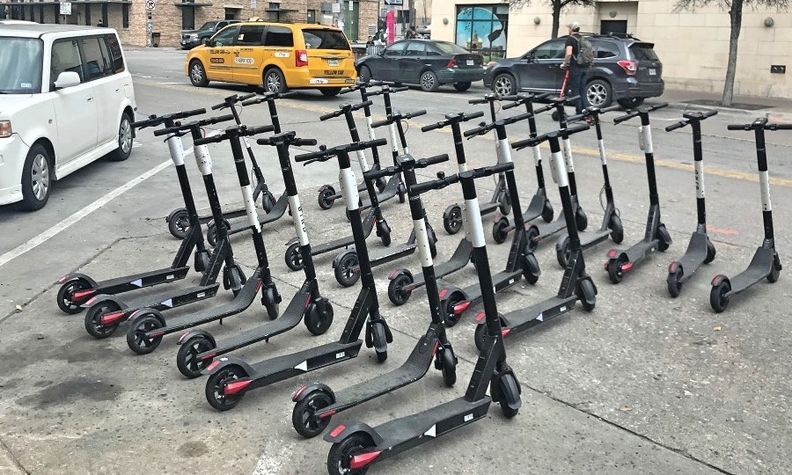 Lime and Bird each have permits for 5,000 scooters, and collectively the 10 companies have permits for 15,300 scooters, a figure that does not include other forms of dockless mobility, such as e-bikes. Lime says it had a 50 percent increase in ridership during SXSW. The city enacted rules to set the stage for burgeoning scooter travel in 2018. Among their provisions, the rules say dockless mobility units may travel no faster than 20 mph "when in the street environment" and must have GPS to help find units for repairs and collect usage information. Further, they require that each deployed unit must average at least two trips per day, or fleet sizes may be reduced. If the rules were a good start, they're still a work in progress. Lime rented scooters during SXSW. This week, Austin City Council will consider an ordinance that requires anyone riding on the sidewalk to do so at "a reasonable and prudent speed," and parking requirements would be clarified. Further, police officers could ticket reckless riders $40 for a variety of offenses. A vote is scheduled for Thursday, March 28. This year, the city's Department of Public Health and Department of Transportation asked the Centers for Disease Control for an investigation of scooter safety. Working with Austin, the CDC is developing methods to find and count the number of injuries related to electric scooters. Preliminary findings are scheduled to be released this spring. For whatever headaches scooters have brought in Austin, they remain a promising solution to the city's transportation challenges. They could reduce the need for cars on congested city streets. A recent report from traffic analytics firm Inrix found that Austin residents spend an average of 104 hours per year stuck in traffic. As the city's population grows, leaders are looking for ways to avoid further congestion. "We are at ground zero of recognizing the need for mobility solutions," said Mayor Steven Adler, who headlined the Smart Mobility Summit during SXSW. Later, he said the most important issues facing the city are "mobility and affordability." Scooters register as solutions to both those concerns. The question of where exactly scooters belong — sidewalks, bike lanes, streets — remains unresolved. "Most cities and city planners would like to see them on the streets, but the reason most people ride them on the sidewalk is because they don't feel safe in the street," said Regina Clewlow, co-founder of Populus, a technology platform that provides information on shared mobility usage to cities for planning and policymaking. "Our answer to that is safer bike infrastructure, which we know is a problem and a challenge and has been for quite some time. Now, with larger numbers of people using bikes and scooters, cities are feeling more pressure to provide that space." Building or revamping such infrastructure is expensive everywhere. As federal leaders consider broad transportation funding beyond the Fixing America's Surface Transportation Act, which expires in September 2020, next-generation transportation systems may be one new focus. For all the talk about self-driving vehicles, providing money for scooter infrastructure might be an idea that merits consideration. "If the next authorization is just about repairing roads and bridges," Bhatt said, "I think that will be a missed opportunity."